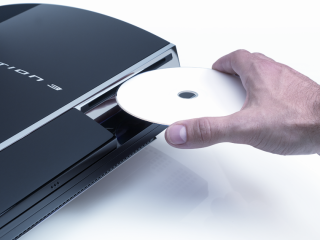 Sony's PlayStation 3 console will not have any effect on the final outcome of the high-definition disc battle between Blu-ray and HD DVD . New research shows that of the 80 per cent of US households which own a games console, only 13 per cent actually use it to watch movies. Many console-owners are not even aware that their games machine can play DVD movies. "Today's next-generation games consoles such as the Xbox 360 or Sony PS3 are true digital multimedia powerhouses," commented Dale Gilliam III, director of primary research and author of the report at The Diffusion Group . "Yet very few of these devices are connected to the internet. And even though these same platforms may feature a high-definition DVD playback system, very few consumers are using them for non-gaming media applications," he said. This is not at all the kind of news that the Blu-ray Disc Association (BDA) wanted to hear. It's hoping that the PlayStation 3's Blu-ray functionality will be enough to give it the edge in the HD war against the HD DVD camp. But if the Diffusion Group's research is to be believed, games consoles are rarely used for watching movies anyway. And so the PS3 is unlikely to have much of an impact on the high definition disc format war. Exactly the news that the HD DVD camp wants to hear.